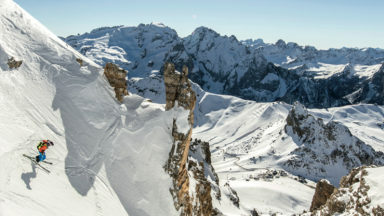 There is a well-kept secret in the southern French Alps, a quiet but unforgettable ski tour which winds its way through the heart of the region. 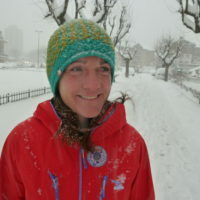 Here professional mountain guide Tania Noakes outlines the Traversée du Mercantour as it passes through the upper valleys of the Mercantour, staying quite close to the main spine of peaks that defines the frontier between France and Italy. 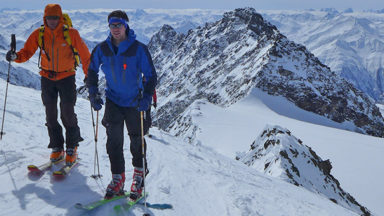 Although the majority of the route stays in French territory, it drops into Italy several times, and along the way there are historical ruins, hidden archaeological mysteries, snow-bound monasteries and remote alpine summits, one of which, Mont Tenibre, is a key passage in completing this traverse. The tour forms a logical and continuous journey linking the Col de Tende to the Col de Larche. 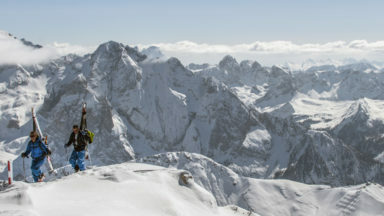 The itinerary suggested here takes in several delightful summits, explores remote valleys quite cut off in winter and connects trailheads at Boreon, Isola 2000 and Bagni di Vinadio. It’s a good option for early season as it’s non-glacial and at moderate altitude. There are several steep passes to traverse so it is a good idea to carry crampons: escape routes are numerous, making it easy to shorten the tour if necessary. The French Alpine Club (CAF) has mountain refuges with fine winter rooms scattered throughout the Mercantour, but it’s worth checking in advance to check they’re open: in the spring refuges may be opened for you if arranged in advance. Most huts have winter rooms, unlocked year-round, where you’ll find bunks, blankets, and pillows: some winter rooms (such as that at Rabuons) have gas stoves that you can use for a few euros extra, but ensure you take enough gas for cooking and melting snow in case the supply at the refuge has run out. A good starting point for this tour is the Italian town of Borgo San Dalmazzo, just south of Cuneo. This is where the road and rail lines from the Col de Tende intersect with the road leading west to the Col de Larche. The closest airports with direct flights to the UK flights are Turin and Nice, both of which are served by low cost carriers. Trains from Borgo San Damazzo take a slow and sinuous route, weaving upwards along the valley and up into the mountains to where, just over the French side of the border, lies the sleepy little village of St Dalmas-de-Tende. Either plan for a night here, or arrive around midday to leave enough time to reach the tour’s first hut, the Refuge des Merveilles, by dark. A short taxi ride is needed to get to the trailhead at La Minière de Vallauria (in the direction of Lacs des Mesches). From here the first day is really only a positioning day. If you arrive earlier at the refuge you could continue to the Refuge de Nice, making the second day shorter. The valley rises up very gradually for a couple of kilometres past a few old buildings and a gite d’etape (hostel, open in spring) before it steepens a little below the lakes on the shores of which the refuge is situated. There is an excellent and magnificently situated winter room here, with enough space for more than 20 people, a wood stove and solar-powered lighting. When we visited it was bitterly cold, like a stone fridge, as if the winter room hadn’t been used for quite some time, so aim to arrive early enough to get the wood burning stove roaring – you’ll be glad of its warmth. From the refuge head north up the Vallee des Merveilles, famous for prehistoric stone markings and pictures on the flat rocks of the valley floor. 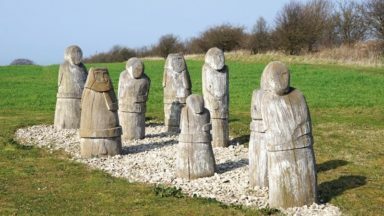 Visitor numbers are controlled, which suggests this must be a busy place, although not in winter: you’re more than likely to find yourselves alone in this fragile and glittering landscape, and the price for this solitude is that the famous stone markings will be hidden under a deep blanket of snow beneath your feet. The valley ascends to the col at its head, the Baisse de Valmasque (2549m). From the Baisse du Valmasque descend on the far side (the skier’s left), traversing above the Lac Du Basto. After a few hundred metres start climbing again along a snowy shelf which leads to the Baisse Du Basto (2693m). The first few turns on the far side of this second col are a little steeper, before the valley mellows out as it approaches the CAF Refuge de Nice, nestled in the base of this valley and surrounded by relatively easy ski peaks. You could stop here, as there is another good winter room: this would allow an ascent of Mont Clapier (3045m), which dominates the head of the valley, the next day. If you aren’t stopping here descend past the Lac de la Fous, aiming for a side valley leading to another col. The traverse swings eastwards and up towards the steep Pas du Mont Colomb (2548m). We booted up the last 50m of the couloir, where it narrows between rock walls and an old boot track enabled our passage without crampons, but the short day’s long shadows were already making the final few metres feel icy and exposed. On the far side of the col there is a delightful descent of sweeping turns into the wide combe below. Lower down in this valley is another CAF hut, but this one is situated at a road-head so is often busy. We chose not to descend all the way to the hut, but instead kept our height and traversed hard right, aiming for a small, steep but short climb to our final col of the day, the Pas des Ladres. 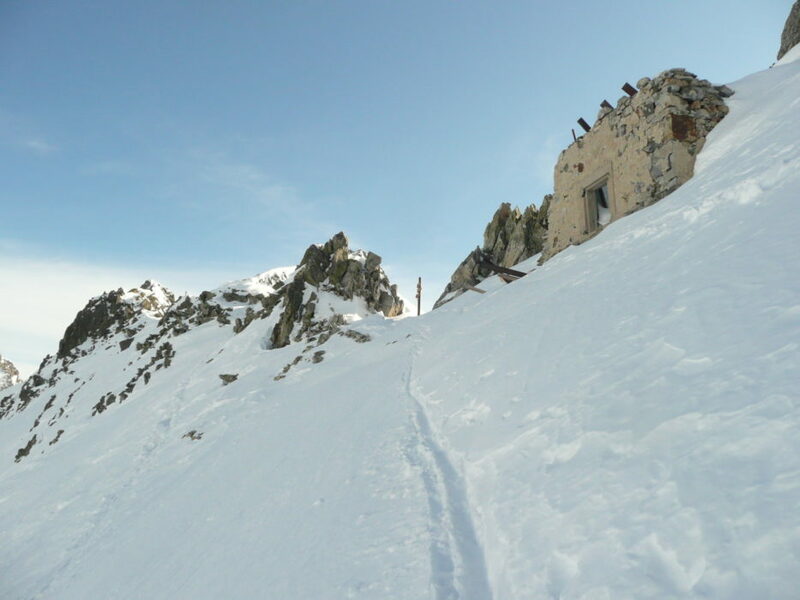 From this col it is possible to descend north to another CAF refuge, the Cougourde, where there is a winter room, but be aware that you must telephone in advance to gain access. We chose to continue our descent beyond the scattered treeline on the valley’s left flank towards the extensive cross-country ski tracks which lead easily to the village of Boreon. Several hundred metres up the road towards the Col de Salese is the very hospitable Gite du Boreon. The Gite du Boreon provides a very warm and hospitable welcome after a long day which would be tricky to complete in poor weather due to its length: various CAF huts along the route make it possible to break this leg into several shorter days if required, and doing so would allow you to take in a few of the ski peaks along the way should you so choose. The road from Boreon towards the Col de Salese is cleared of snow up to a hydro-electric station about 1km from the Gite. 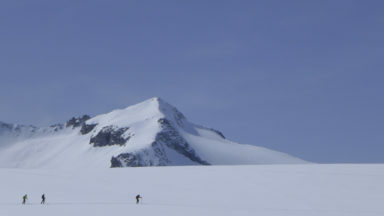 From the end of the cleared section it is possible to continue on skis along the summer road, gaining altitude steadily to the first gentle col. Just after the highest point (when the snow is stable) it is possible to traverse right almost immediately into the open wooded bowl above. When the snow is less certain it is better to descend the road on the far side before picking up a small forest track which leads back into the same drainage by a safer line. A little over 1hr from the Col Salese is the Lac Negre, a very beautiful little lake surrounded by summits which can be reached easily on skis. From here you head northwest towards the steep south-facing slope of the Breche Margiole. The base of the couloir dropping down from the col is broad and a little vague: in poor visibility and without previous knowledge of the route it might be difficult to locate the right place to start your ascent. This critical slope faces south and warms up quickly, so be advised to arrive at this point early enough for the snow to be safe. 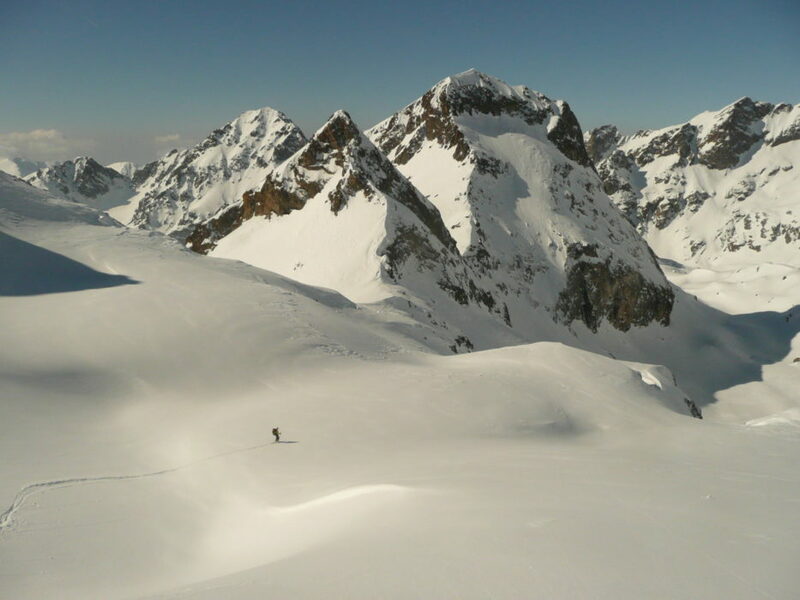 The slope, although steep, can be ascended on skis almost to the Breche, until a short boot-pack close to the rocks on the left hand side brings you to the ridge. At the col you stand on the border with Italy, looking down into the tight valley containing the Refugio Questa. The winter room here is locked, but if you could gain access it would provide a better place to stop than Isola 2000 proved to be. We found the descent to the hut in beautiful powder, and sadly it was over all too quickly. It is best to put skins on just before the hut, since the ground leading north to Lago di Valscura is more undulating than it appears on the map. Just before the lake the route drops steeply down to the eastern shore close to the outflow: if you continue higher and drop down later the slope to the lake is steeper and more avalanche prone. 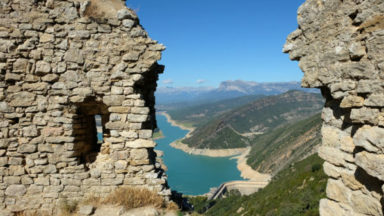 Cross to the far (north) side of the lake and skin up in a rising traverse towards the distinctive military fortress perched in the hanging basin above. This leads almost due west to the short climb of the Baisse de Druos, which opens out onto the slopes above Isola 2000, the largest ski resort in the southern Alps. Most of the decent from the col is off piste, and only joins the maintained trails close to the resort itself. Isola is a somewhat bizarre interlude in this wild and remote-feeling tour, as if we’d stumbled into the ski resort version of Las Vegas. No doubt we looked as out of place as we felt, and to compound our error we arrived at the peak of the French holidays with no pre-booked accommodation. It is definitely worth planning something in advance for your night spent here: we ending up hitching down to Isola village and spending a night in a caravan, but at least we found something! From Isola 2000 it is about 1hr’s easy skin up the piste to Col de la Lombarde (or for non-purists a very easy 10mins on the chairlift). From the col you can cruise 3kms down the Vallone d’Origials until it is possible to cut back onto the left bank just before the Sanctuary Santa Anna. A rising traverse through trees brings you to the snowed up sanctuary itself, a beautiful sight in a very peaceful setting. From here there are several options. In stable snow you can make a gradually rising traverse over steep south facing slopes to the Passo di Bravaria. We didn’t like the look of these slopes, which get the sun early and warm up very quickly, so opted for the less exposed route northwest to the Passo Tesina, taking in the Cima Tesina (2460m) on the way. The valley below provides a thoroughly enjoyable descent almost to the empty hamlet of Callieri at its base. 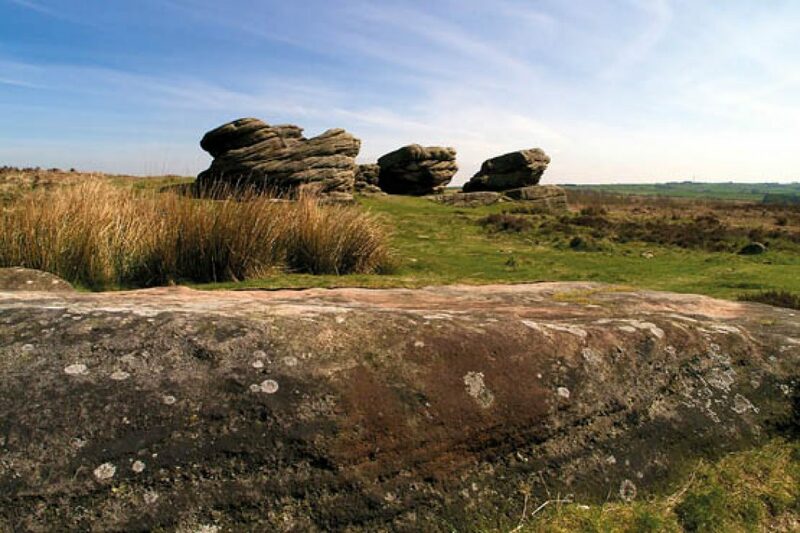 Just before you arrive though you are treated to a couple of kilometres of narrow tree and boulder dodging… just to keep you agile! From Callieri hop onto the cross country tracks and cruise down to Bagni di Vinadio. There are plenty of gites in Bagni, together with a thermal bath on the outskirts of the village to ease any tiredness from your body. This day is a steady climb in beautiful surroundings, and gets you into position for the key section the following day. From Bagni di Vinadio climb initially on the right hand bank of the river and then, as the valley swings to the west, on the left-hand bank, until it steepens before reaching the Refuge Migliorero, a grand old building perched on a small outcrop in the centre of the wide Ischiator Valley. If you are fit enough I would not stop at Bagni, but instead make the extra effort to get up to this refuge and enjoy the evening sun in a truly amazing setting. The Club Alpine Italian winter room is usually open but, call to check. From Refuge Migliorero the valley rises more steeply toward the Col D’Ischiator and your passage back over into France. Several sections on this ascent need careful attention given fresh snow. When you reach the col most of your work for the day is over, so it is worth taking a little time to enjoy your surroundings, perched as you are on the very frontier between Italy and France and about to commit to the wild and isolated combe beyond. Drop down a few turns to the right on the far side of the col to a small crest, before plunging northwest into the combe above the Lac de Rabuons, steeply at first but quickly opening and levelling out as it leads down to the Lac de Rabuons. It is worth trying to keep a little height to allow you to traverse the east side of the lake almost to the hut itself: avoid going too close to the lake shore as during the course of the winter the water level drops, leaving large crevasse-like features around the water’s edge. We thought that the Refuge de Rabuons – itself is also in another fine, but serious, location – had the best winter room of the entire journey. Escape from here down the valley to France should not to be attempted: serious landslides have made this potentially life-threatening. In the event of bad weather it is better to return the way you came or sit it out at the refuge. 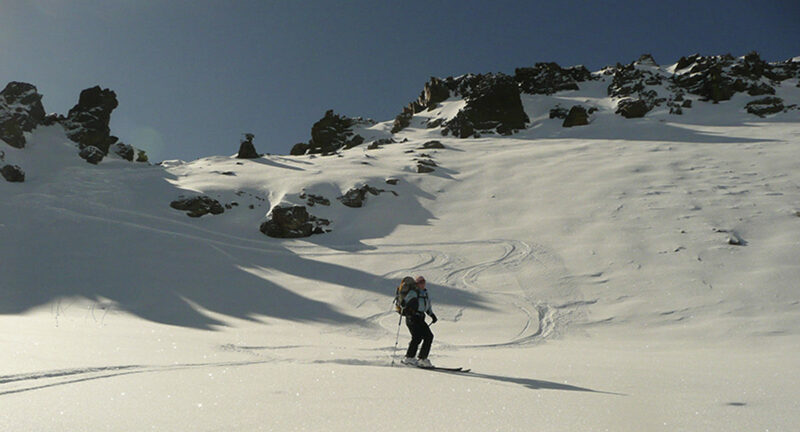 This day is a fantastic ski touring adventure in its own right and one of the most rewarding days of our week’s tour. Ideally you will have good weather and stable conditions: if you’re as fortunate as we were there’ll be fresh snow to play with as well. Start by heading head north around the west shore of the lake before following the watercourse which feeds it. Past lakes Chaffour, Cimon and Montagnette successively, the route finally reaching the pass of Rabuons at 2872m. From here climb up into a little combe just east of the ridge which leads to the fore-summit of Mont Tenibre, from where a narrow ridge leads easily on foot to the main summit cross (3031m). In good snow conditions you can ski from the summit, but beware of hidden rocks on powder days. There is a short steep section on the west flank before the ground levels: from here continue west along the rounded rump until, at around 2850m, it’s possible to drop right into the combe a little west of southwest. A further few short, steep sections follow before the gradient flattens. From here traverse right onto open slopes: avoid losing too much height, as you will only have to ski back up to the Lac de Tenibre immediately afterwards. From the Lake you head steadily northwest towards the prominent Breche Borgonio, easy to identify in good weather thanks to a prominent water-measuring device seen clearly from the lake. The crête de Marie leads you towards the rocks just below the Breche, from where we cramponned the final steep slope to the col itself, before one of the most wonderful descents of the entire tour lies, the Terre Rousse valley to the Refuge des Lacs de Vens. Start with your skins on and ascend the slope directly behind the refuge. This leads steadily upwards through scattered limestone fingers and arches to the flat area of the Col de Tortisse (2591m). From here it is best to drop down a little way north before traversing and climbing to the Col du Fer (2584m). The slope above you on the right can be traversed higher up, but is prone to wind slab. From the Col de Fer keep your skins on and follow the crest of the ridge as best you can, without great difficulty (although at times exposed and corniced) to the summit at 2749m, high above the Pas de Morgan on the left. Depending on snow conditions you may want to cross this on foot. From the summit the traverse descends northwest over easy slopes in the Pas de Gorgeon Long towards a shepherd’s cabin. Then an easy skin to the Col de Pouriac (2506m) takes you back onto the frontier ridge. Keeping the skins on, traverse the flank to the northwest to pass below the foot of the Rochers des Trois Eveques. Keep to the north below the col, then climb northeast towards a steep balcony under the rocky wall of the Rocheuse de L’Enchastraye (stonefall is possible here) to a small steep combe leading towards the Pas de L’Enchastraye (2890m). If you have enough energy left you can ascend the Tete de L’Encastraye by the northeast arete on foot and then return to your skis at the col. The final descent of the tour starts steeply at first, as you drop northwest to a little lake below the col. From the flat section below the lake head a little north of northwest on the left flank just to the crest of a point at 2716m. The ski descent of this north facing triangular slope is a beautifully sustained 30º and a true pleasure to ski, delivering you in no time at all to the almost flat valley floor of Val Fourane, at 1985m. All that is left is a long, almost flat ski (perhaps on skins) to Pont Rouge (1907m), where you pick up the forest track leading northwest for 5km to a bridge at 1690m and a little later the village of Larche (1680m). Here there is a Gite D’Etape and a hotel.